This amazing ring is 18KT White Gold, 18KT Gold with Palladium alloy and 18KT Rose Gold set with Demantoids. 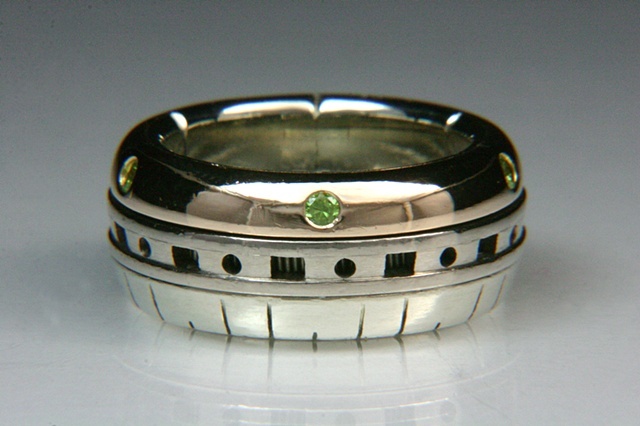 This ring represents the Space Needle. It's center portion spins across 144 hand crafted 14KT White Gold pin bearings. This ring is filled with sacred mathematics and meaning to the wearer. This is a one of a kind ring and will not be reproduced. If you would like something as complex and unique as you are, please contact us to discuss your idea.